Noah – Special Abbreviations: Knot 15 – This is for you Ted! 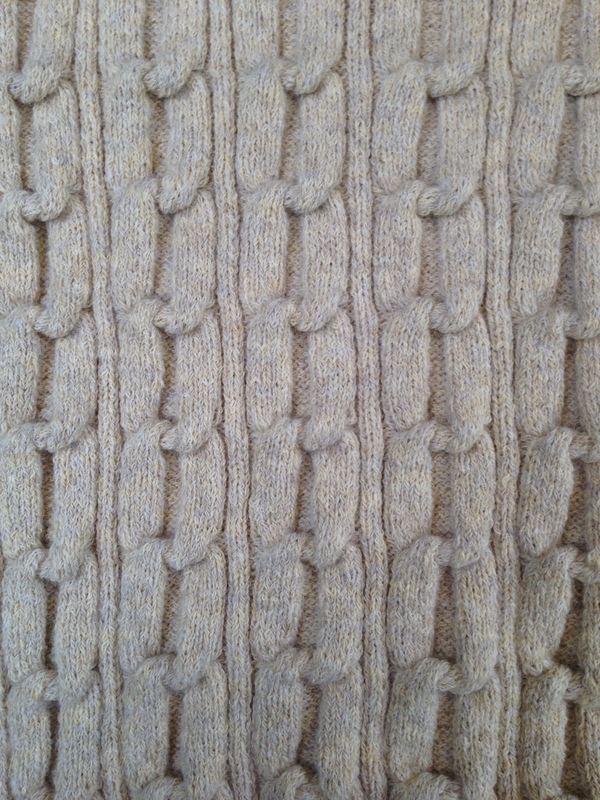 A few days ago I posted about one of my actual knitting project Noah a design from Rowan Brochure Homestead Classics. As you can see this design is featuring a lot of cables. But when I read the description of this cable in the special abbreviations for the frist time I thought by myself “Huugh?” You know I’m not a native speaker, but this time I was lucky to have also the german instructions. But also then I don’t was sure how to do this cable. During knitting this sweater – after it was long on my to-do-list – I took some picture doing the cable. 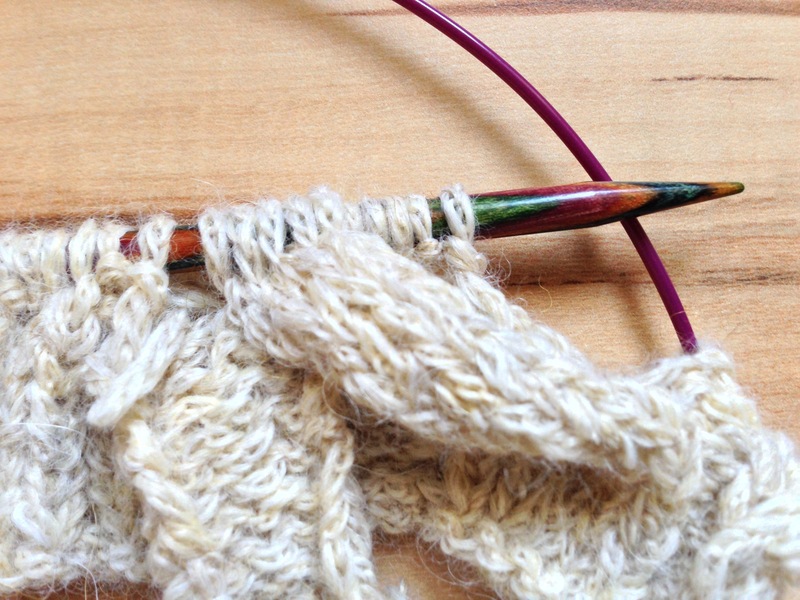 Now Ted asked me how to knit this cable. So I will show the steps one after another. 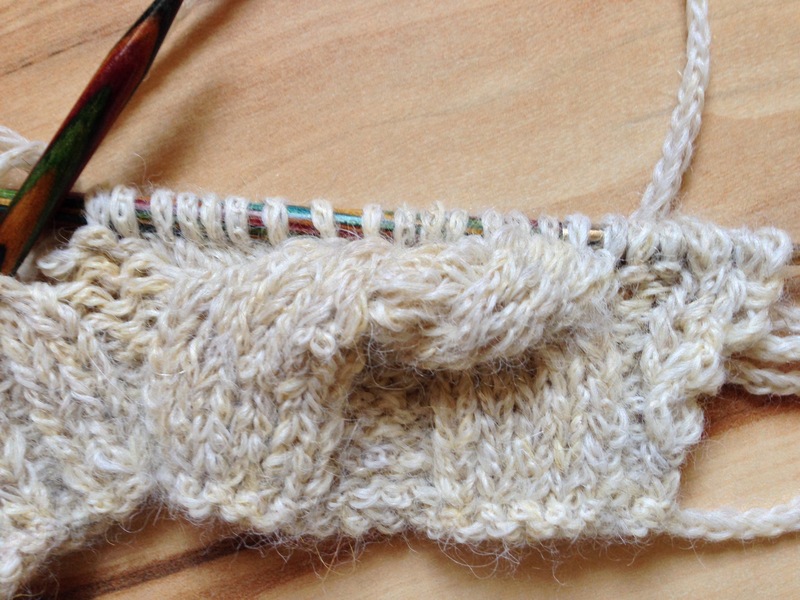 I hope it will help you to knit this really stunning design. 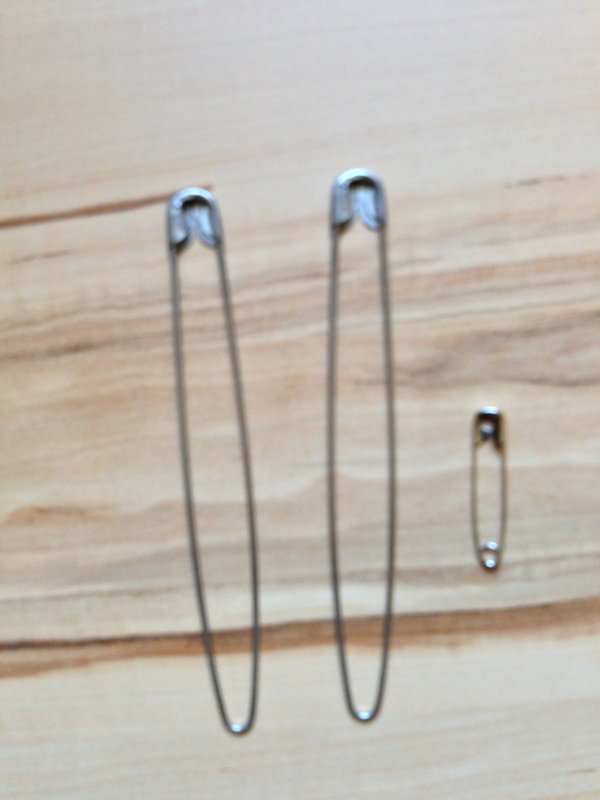 In the booklet you need 1 yarn holder, 1 cable needle and 1 safety-pin. I used two yarn holders instead of the cable needle! 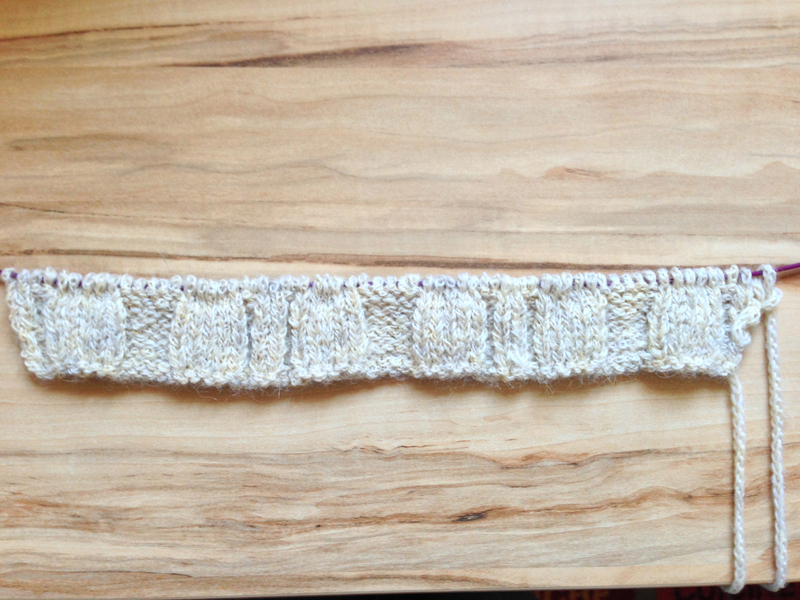 6 rows of the pattern are knitted, RS facing now the row with the Knot 15 will be knitted. 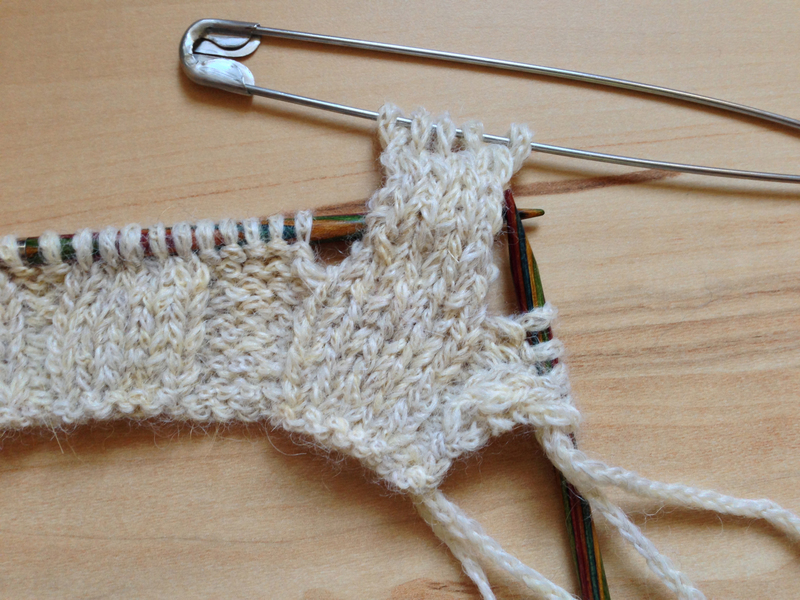 (K5, turn, P5 turn) 4 times, break yarn and leave these 5 std on a holder. 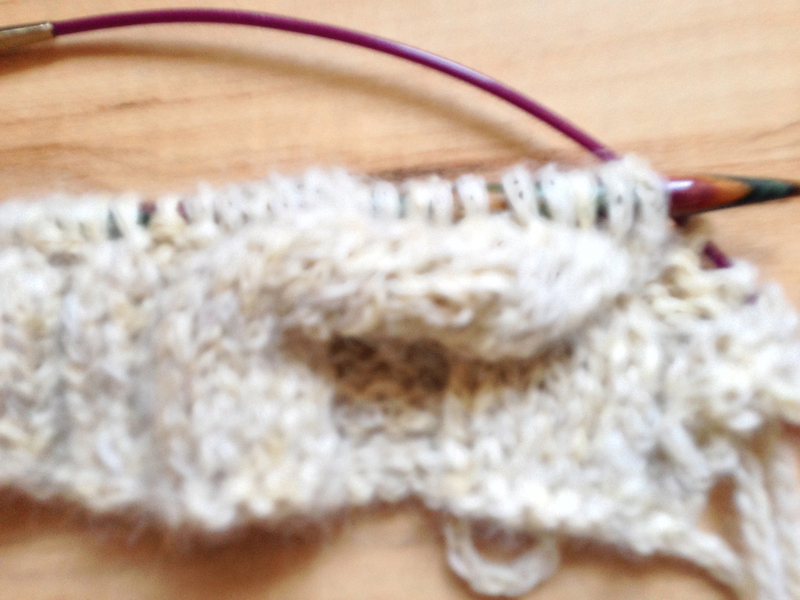 Slip next 5 std onto cable needle (here second yarn holder) and leave them on the back of the work. 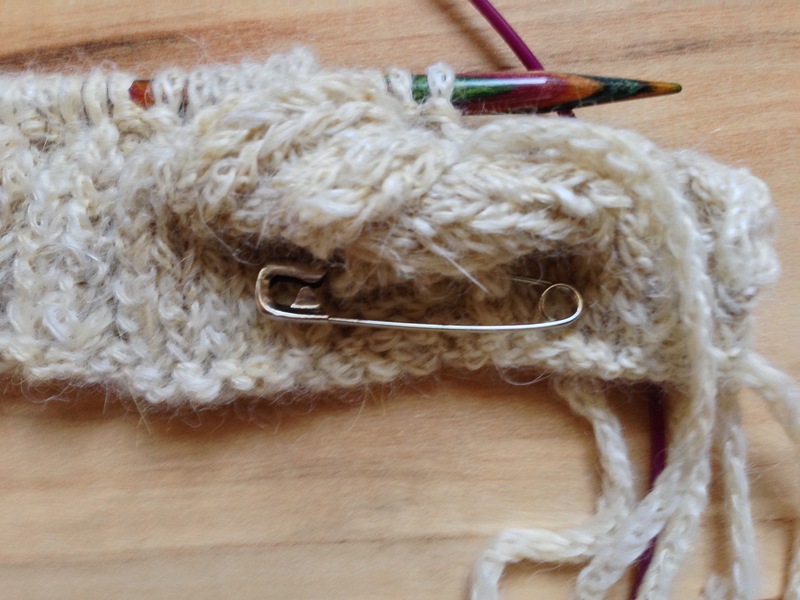 Rejoin yarn and work across next 5 st as folls: (K5, turn, P5, turn) 4 times, break yarn and leave these 5 sts on a safety-pin. 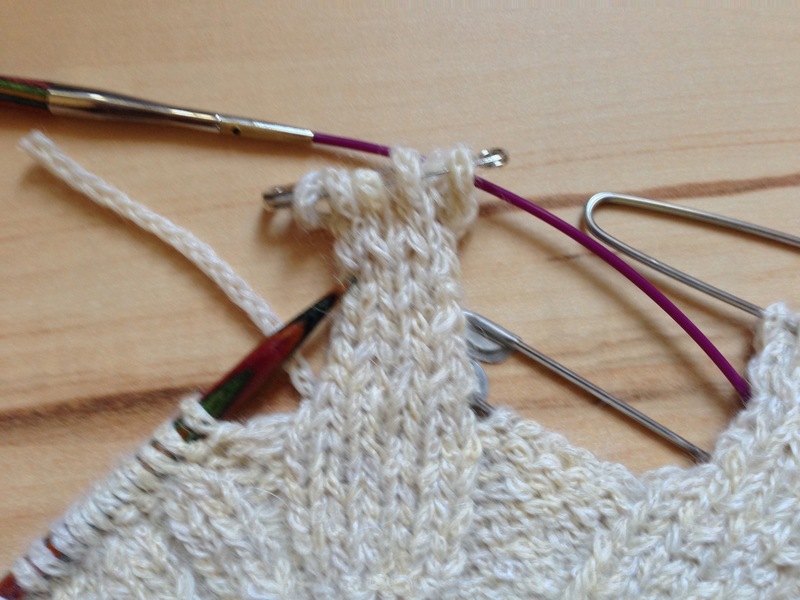 then slip 5 std from cable needle (here second yarn holder) onto left needle, keeping them behind sts from holder. 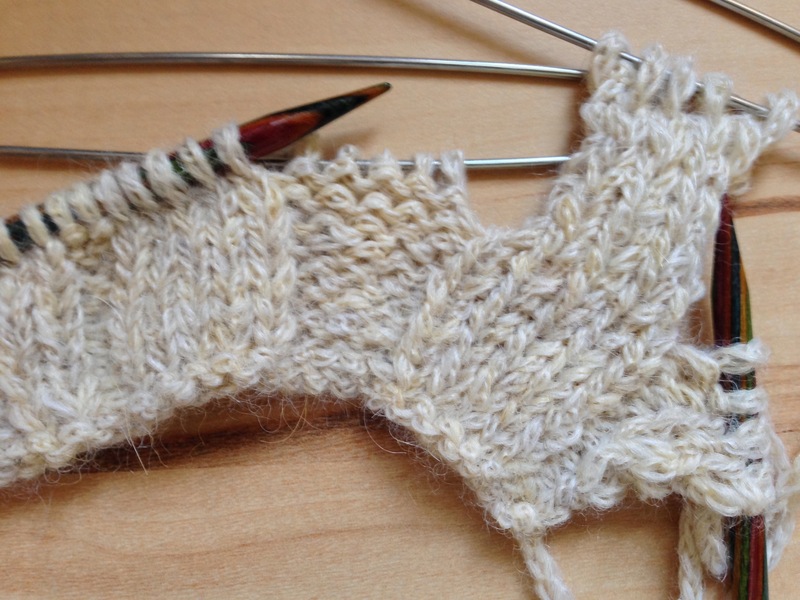 then slip these 5 sts onto left needle. 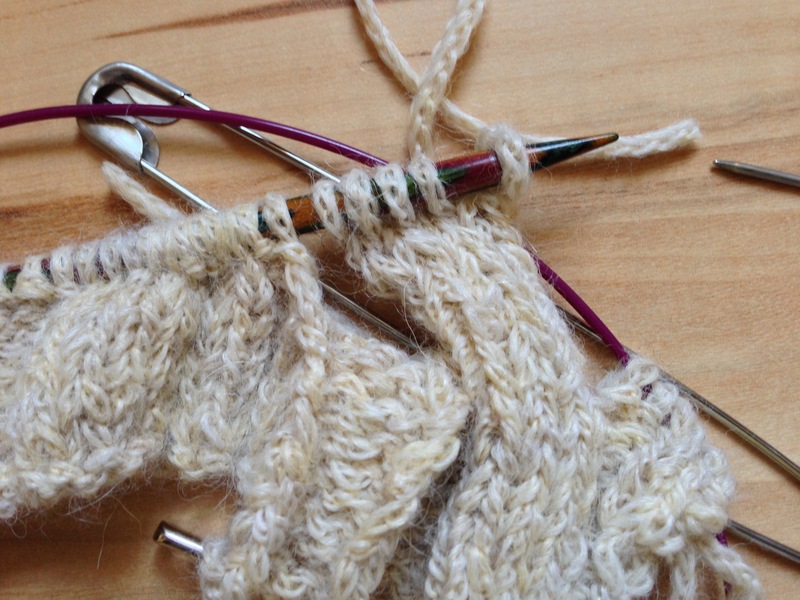 Rejoin yarn and work across all 15 sts as folls: K5, P5, K5. 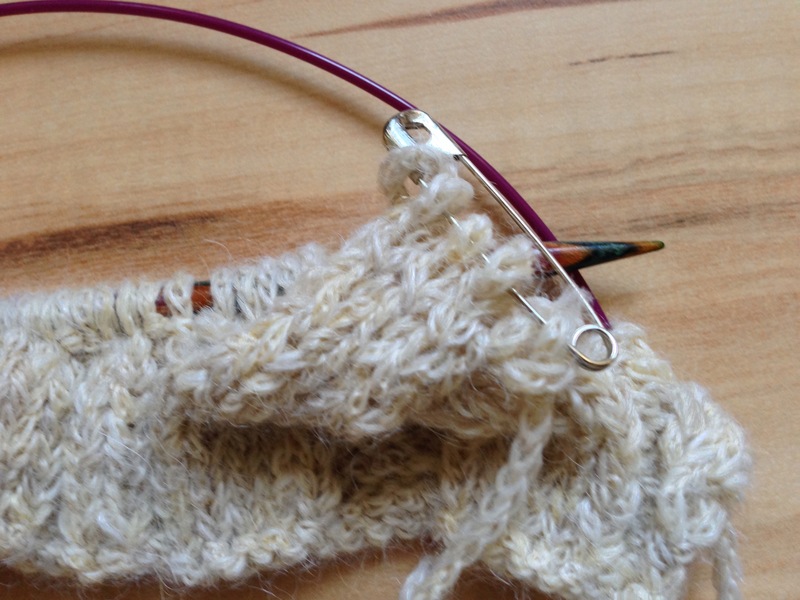 Hope this helps you to knit this stunning cable, that is actually a knot in the garment! Oh, no! This would make me totally crazy! But it is very interesting to see how the knots are done. Thank you, Konrad. 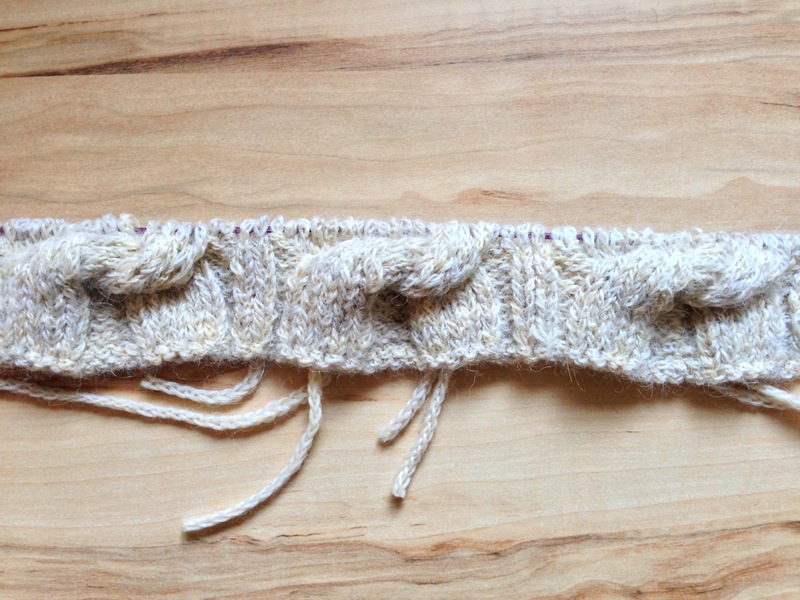 It’s only slow knitting! But the result is looking great! Wow that looks really great! Thanks for explaining! Really beautiful pattern. Very cool, I’m starting to understand it now! My, that is time-consuming isn’t it. Actually it is the same as if to fasten ones shoes! I needed about a half hour for one knot row, Dayana. But Noah is already blocking!